When legions of PC users dip into Windows 8 for the very first time in late October, they’ll be greeted by a Start screen that runs only what Microsoft is calling “Windows 8 apps”—touch-optimized programs designed for the new operating system’s live tile interface. The tiled Start screen can't be skipped, so for better or worse, Microsoft is foisting a brand new software ecosystem on the PC-loving public. Sure, any Windows 8 device running on an x86 processor will still be able to run traditional software (now called “desktop applications”), but by pushing the new apps to the very front of everyone’s Windows experience, Microsoft is betting its future on the new tile-based interface and its only compatible apps. 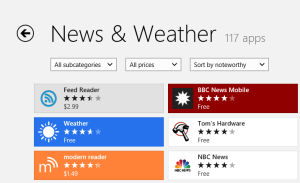 The only place to get the new apps are in Microsoft's own curated Windows Store. So as the Windows Store goes, so goes Windows 8—and Microsoft itself. But the clock is ticking. Today is Oct. 1 and Windows 8 launches on Oct. 26. Microsoft has entered its home stretch. With less than a month remaining, will the Windows Store be ready for its big software coming-out party? We picked the brains of more than a dozen top analysts and developers to get a handle on a situation that’s beginning to look quite worrisome. Conventional wisdom says that a modern software ecosystem needs a large number of apps to be successful. For perspective, consider that the Android and iOS platforms boast 675,000 and 700,000 apps respectively. Granted, only a tiny fraction of those apps are worth downloading, but even taking that into consideration, the Windows Store looks to be in serious trouble. According to WinAppUpdate.com, an app-counting site run by independent analyst Wes Miller of Directions on Microsoft, the Windows Store didn't even crack the 2000-app threshold until September 21. Or, to put it another way, the entire Windows Store inventory currently comprises just 0.3 percent of the Google Play Store. "Is the Windows Store lagging? To me, yes. I'd much rather see a much higher number a month before launch," Miller told PCWorld. When your app storefront includes only 117 news and weather apps, and one of them isn't CNN, you know you have a bit of a problem. The current dearth of apps gives the Windows Store an abandoned, neglected feel. While the Games section shows a pulse of life, the Social, Productivity, Shopping, and Food/Drink areas look particularly barren. The low number of apps is a catch-22 for Microsoft, says Rob Enderle, the principal analyst of the Enderle Group. "Developers don't want to develop for you until you have enough users, while users don't want to use your [device] until there are enough of the key apps," Enderle says. "That is the critical weakness of the Windows Phone store, and the Windows 8 store is even younger than the Windows Phone store. There's a content problem for the Windows Phone store, and I expect there to be content problems with the Windows 8 store, as well." These content problems could turn into an existential threat for ARM processor-based Windows RT tablets, which run only Windows 8 apps and can't utilize the software that’s now classified as desktop applications. The fewer Windows 8 apps that are available, the less appealing Windows RT tablets—such as Microsoft’s own Surface RT—become. "The most important thing Microsoft can do for the Windows 8 launch is to launch with 5000 high-quality apps," says Patrick Moorhead, principal analyst at Moor Insights & Strategy. "As the industry learned from the failed consumer tablet launches of the Motorola XOOM, HP Touchpad, and Blackberry PlayBook, the number of quality apps at launch does matter." Are the available apps any good? A lack of quantity can be somewhat mitigated by an abundance of quality. 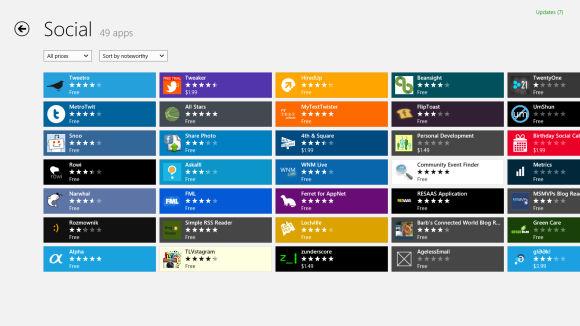 Unfortunately, the quality level of the available Windows 8 apps is just as troubling as the Store’s low inventory. Simply put, a lot of must-have apps aren't available yet. In fact, most Windows 8 apps currently exposed are simple games or uninspiring programs with names like "Girl Farts" and "Let's Speak Beckinese!" The first sign of trouble appears in the Windows Store's Spotlight section: Are apps like "Periodic Table" and "Disk Falcon" really the best and brightest Microsoft has to offer one month before launch? The Windows Store boasts only 49 social apps, and so far doesn't include any official apps from the big-name social networks. To be fair, Windows 8 isn't totally devoid of top-tier offerings. Today you can click on the Windows Store tile and find Wikipedia, Slacker Radio, eBay, StumbleUpon, Evernote, iHeart Radio, and the Kindle reader. As for gaming apps, you’ll find Cut the Rope and Fruit Ninja. (Don't be fooled by the Torchlight app, though. It's a flashlight tool, not the game.) Geeks will also be pleased to find Windows 8 apps from Newegg, Kaspersky, Norton, and Splashtop Remote Desktop, as well as several nifty (and unofficial) XKCD apps. All that said, the missing apps are glaring omissions. As of press time, there's no Facebook app; no Twitter app; no YouTube app; no CNN app; no IMDB app; no Dropbox app; no Netflix app; no Hulu app; no ESPN app; no MLB at Bat app. There are no YouTube, Google Maps, or Gmail apps. The list goes on, and there's no indication as to whether those critical apps and other essential downloads will be available when the Windows Store officially launches. Some apps may seem like no-brainers for inclusion—Facebook has a strong relationship with Microsoft, while Netflix and Dropbox seemingly appear on every platform on the planet. But the only thing we know for certain is that most of the big names simply can't be found in the Windows Store yet. We reached out to the developers of several top-shelf apps that have yet to appear in the Windows Store to determine if more big-name Windows 8 apps are forthcoming, or possibly even already completed and just biding their time until launch. Instapaper and Facebook never replied to our queries. Pandora and SoundHound refused to comment about their plans for Windows 8. Gameloft and WorldMate said they plan to be in the Windows Store, but wouldn't state whether their apps will be available on October 26. A Google spokesperson simply said, "Our goal is to give users a seamless, beautiful experience for users across Google products on any device." Beyond that, a Windows 8 Chrome app is definitely in the works. Most companies are keeping their cards close to the chest—but not all of them. Several app makers spoke more candidly, and their feedback could shed light on why the Windows Store isn't overflowing with apps.